So the weekend’s almost here, and you don’t have plans. Hey, we’re not judging – sometimes you just need a little downtime. Whether you’ve got a babysitting gig to attend to, or intend to simply coast through the weekend in a Homecoat, we’ve got a bunch of great new Android games without time-limiting energy systems for you to curl up with. Survival Heroes is a wildly creative game that combines the fantasy/RPG elements and top-down perspective of MOBAs with the intense last-man-standing gameplay of Battle Royale games. Single, duo, and squad game-modes makes this the perfect game to play with friends for anyone who likes fantasy and intense, competitive, multiplayer action. I’ve been having lots of fun with this title all week – it honestly feels like the multiplayer game I’ve always wanted on mobile. Get Survival Heroes on Google Play. Trigger Heroes from Lucky Kat Studios is a great new action roguelike with a polished 8-bit art style, in which you fight your way through randomly generated caves, powering up your character and weapons along the way. The gameplay is fun and challenging, and the controls are dead-simple, so you can dive right in without having to learn a complex system. And of course, the levels are endless, so you can play until the sun comes up. Get Trigger Heroes on Google Play. Pick a car, smack an over-the-top gun on top of it, and destroy the opposing team in a small arena in short multiplayer matches. That’s Metal Madness in a nutshell, and I can’t get enough of it. Its chaotic gameplay reminds me a bit of the demolition-derby-themed “FlatOut” PC games. The graphics look great, the controls are simple, and the team deathmatches last just two minutes each, so you can pop in for a quick round if you’re short on time – or lose the evening to several in succession. Get Metal Madness on Google Play. This is a 2D top-down Battle Royale “.io” game with several game modes, including a 100-player match. The simple art style allows the game to run even on a potato of a phone. And while it’s similar to other games in this niche, it’s surprisingly more fun than the rest of the lot, in that it’ll have you in stitches by the time you’re done with your match. Get ZombsRoyale.io on Google Play. 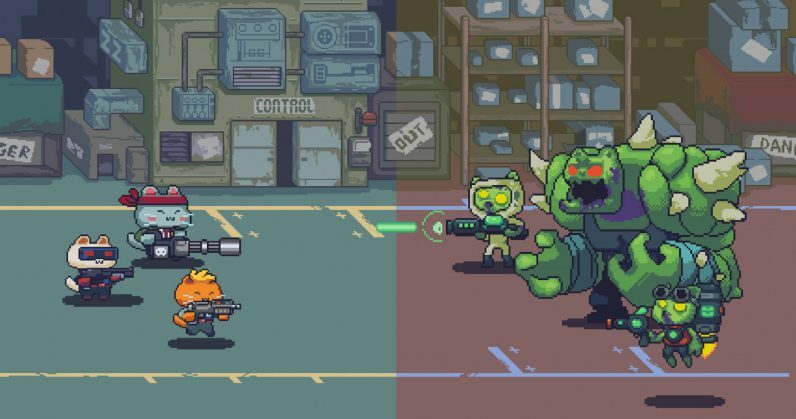 At under 40 MB in size, Cat Gunner is a small, but really fun, action cat-zombie-shooting game that reminds me of Dead Ahead, except that it’s split into distinct levels instead of having you play endless runs. With 10 weapons and six cat heroes to unlock with currency earned in-game, there’s plenty to keep you occupied. You’ll need all that firepower to fight your way through the 30 story missions on three different difficulty levels, as well as the special “events” missions that you’ll have to take on in this 2D side-scrolling adventure. Get Cat Gunner on Google Play.